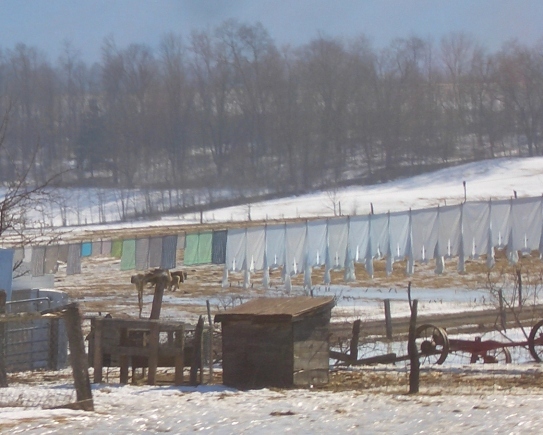 Following up 10 views of Lancaster County, here are 10 photos from another Pennsylvania Amish settlement. 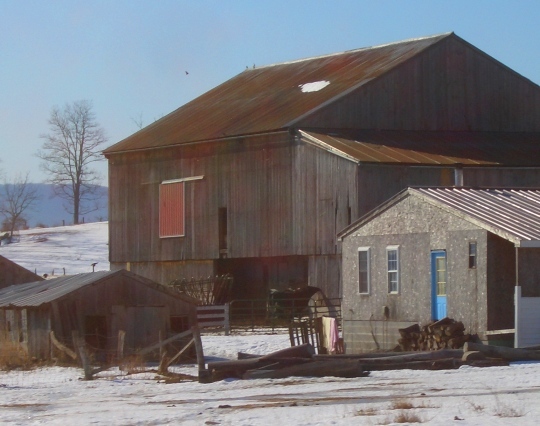 Big Valley, officially known as Kishacoquillas Valley, is home to the second-largest Amish community in Pennsylvania. 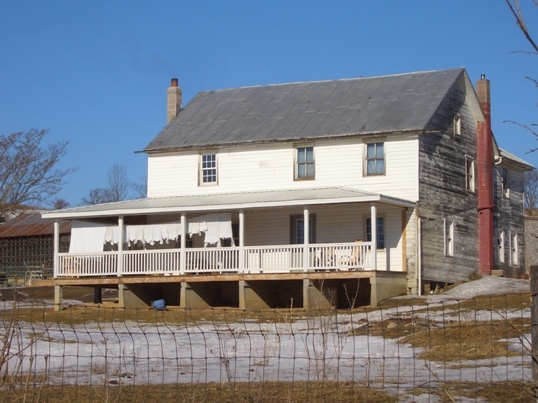 Big Valley is located in Mifflin County in central PA. 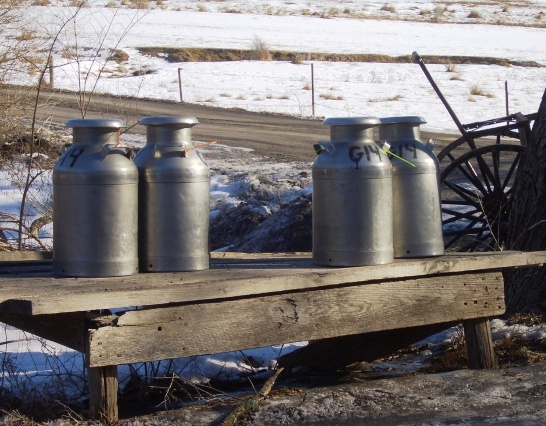 Here you’ll find three distinct Amish groups–Nebraska Amish (white-top buggies), Renno Amish (black top) and Byler Amish (yellow). The valley is truly a beautiful place, as you can see by these shots taken just a few weeks ago. I was lucky to have a lovely sunny day for the most part. The snow began melting towards the end of the day. Hope your day is full of Peace & Happiness! The reflection or image of the woman looking out of the window in the first photo was the first thing I noticed. Beautiful, beautiful!!! I especially like the last one, reminds me of the hills around back home. Those pictures are beautiful. Wish I was there to see them. 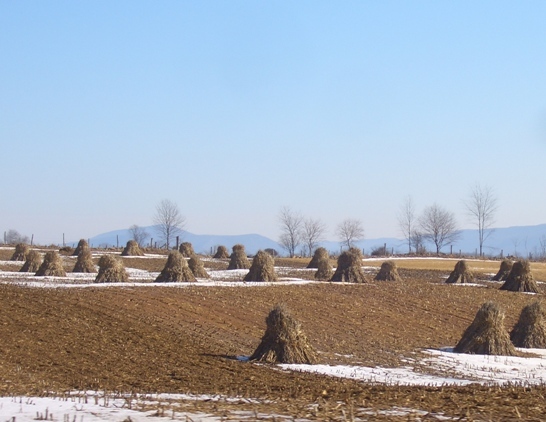 Makes you want to get in the car and drive to Lancaster County. When I use to vacation and visit friends in Lancaster-I wish I knew then what I know know. 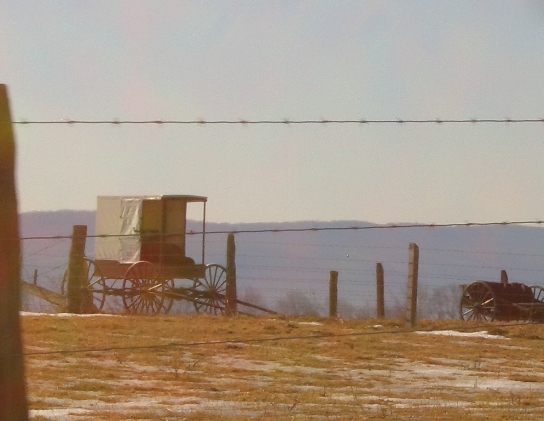 Know that I know more about the Amish, I would enjoy it more. Beautiful pictures … I especially like the one of the mother tending her garden and her precious little girl looking on. The children are precious! The Nebraska Amish live up towards the central-northern part of the valley, and I started way at the top and made my way down to the southern, or I guess southwestern end. As you go down you get into the areas with the Renno and Byler Amish. I do wish I had gotten better shots of the blue doors which you see everywhere at Nebraska Amish farms. The patches of snow really made things look nice though. Glad you’ve enjoyed the photos, this was just a great day. Not a windy one like with the Lancaster photos, but a wintry one. Richard on the documentary, I don’t know if and what the air dates will be in the states. From what I understand though, I believe BBC is going to enable worldwide access to its online videos, so maybe that will be one way to view it, will let you know if I hear. By the way it’s interesting you all noticed the face image in the window in the first photo. As I was putting this together I noticed it too. When I look close or even enlarge the original photo I can’t tell for sure where it comes from–I don’t think that was a person there though. Michelle you are right, kind of eerie. Erik, do Nebraska Amish refer to themselves as Nebraska Amish as well? I always find it funny there is a group named after my home state that don’t live there but in PA. Funny too that Nebraska (the state) is very conservative as well, just like this group! Lindsay, are there Amish communities in Nebraska? 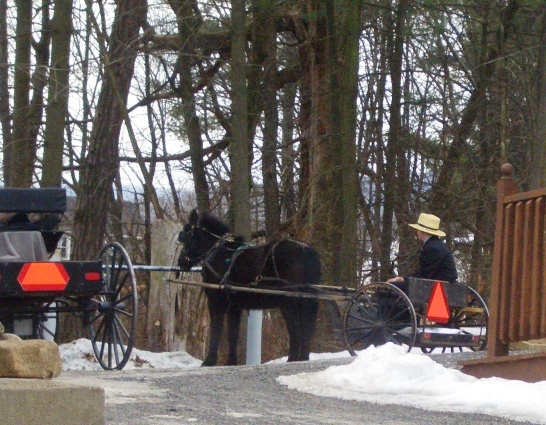 I never realized there were so many different communities outside of Lancaster/Lebanon Counties in PA until recently with all the different buggy styles. I only thought they were all grey, like those in “PA Amish Country” and Southern Maryland where I grew up. Erik, any explanation for the different buggy styles and colors? Also, notice that the ladies'”kapps” are different styles outside of my more “familiar” Amish areas. Hi Everyone. Nice photos Erik! Does anyone know of a nice roadside motel-other than the typical chains-in the Big Valley area? My husband & I are planning to go out there in May for about 5 days and there only seems to be a few chain hotels around Lewistown, and of course up at State College. Would appreciate any other tips or info about the area, as well. Thanks! That window thing is kind of creepy. It is neat what glass can do to a person’s camera or even a person’s eye. Could be mistaken for a ghost. Hopefully the family that lives there isn’t superstitious! Lindsay, yes unless there is another term they would also use. In the Amish Almanacs they are referred to as “Nebraska”. The name came from an early Bishop who had led a church for a time in Nebraska. 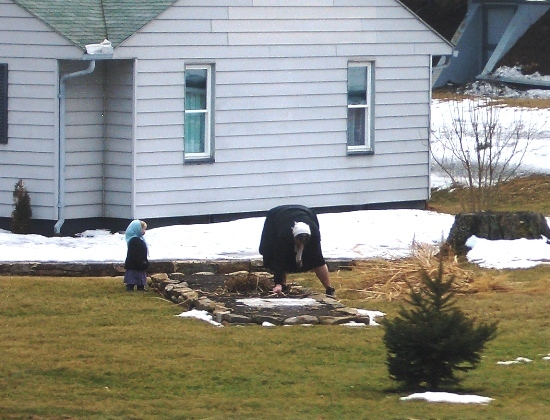 Robin, Amish have never had a huge presence in Nebraska, but there are currently 2 very small communities in the state, in Knox County and Holt/Antelope County. Probably not more than a handful of homes in each. Debbie, I don’t know much about the motel/hotel situation in the Valley but Claudia Myers who sometimes comments on this site runs a Bed and Breakfast in the Valley. 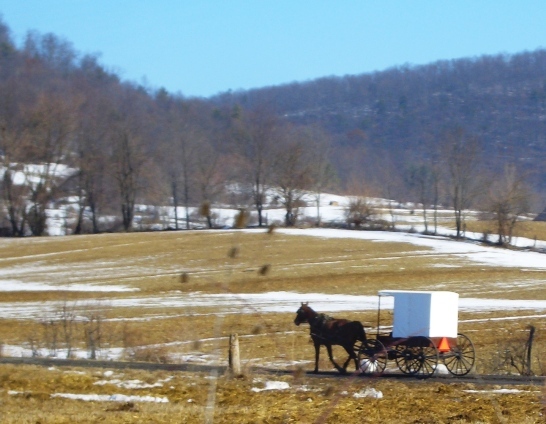 Why are Amish buggies different colors? Robin, your second question about buggy colors will make even Amish scratch their heads. There is some speculation about the origins of some of the colors (if I remember correctly I think it’s said the Byler Amish yellow top may have come from a material commonly available at the time) but I don’t know that I’ve seen a lot of great indisputable origin stories (though someone else might be able to give you a better answer here; I haven’t done a ton of digging on the topic). Erik, there is also a settlement in Pawnee County, unless that one has dissolved in the past year or so? 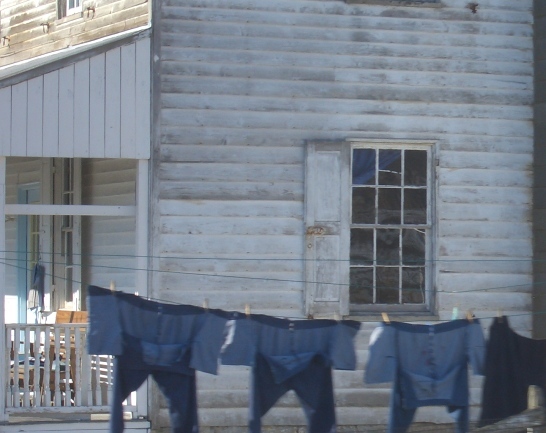 I found a pdf document online as of Nov 2010 there are 19 Amish families in Pawnee County…not large, but the article seems to indicate it is growing. When I’m back home in May I may take a trip down there and check out the settlement (if it is still there). Hi Lindsay, very well might be one in Pawnee Co, do you know the town it’s near? Pawnee City would be the town. It’s the same area the first group of Amish settled in the late 70’s, but they left only after a few years (apparently due to the schooling issue). I also heard mentioned some families settling near Table Rock, NE which isn’t that far but I can’t really confirm on that point. Bob glad to hear it, let us know how the trip goes. What we need next are “Pennsylvania Amish” in Nebraska. Actually off the top of my head I do not know the origin of the Amish currently in Nebraska, doubtful it is PA but wouldn’t it be funny.